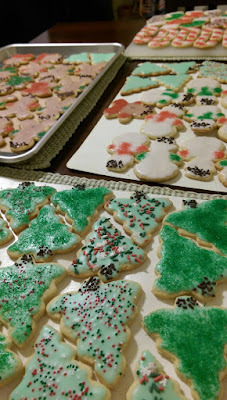 DIY, beauty, baking, knitting, and random musings: nothing is off-limits as I blog my journey through life. 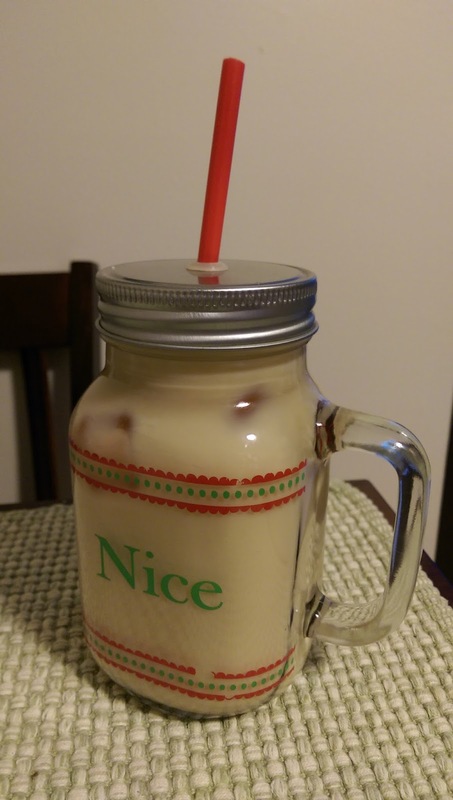 With summer upon us, I've switched from hot tea in the morning to an iced, caffeinated beverage. One option I've been utilizing is to brew tea the night before and then chill it in the fridge overnight. 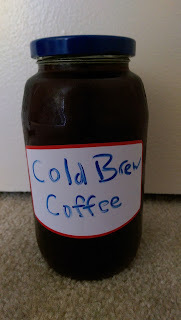 I have also started making myself cold brew coffee as well, though. There are many benefits to cold brew for me. First of all, because it isn't brewed hot, you don't have to wait for it to cool and chill. Another benefit is that there is no smell of brewing coffee, which gives my husband a headache. It also stores and keeps much better than hot brewed coffee. I also think you get a stronger cup of coffee from less beans, so it's also cost efficient. I first tiptoed into the world of cold brew by buying the pre-made stuff from Trader Joe's, which is quite delicious. However, it is much cheaper to buy the beans and make it yourself. 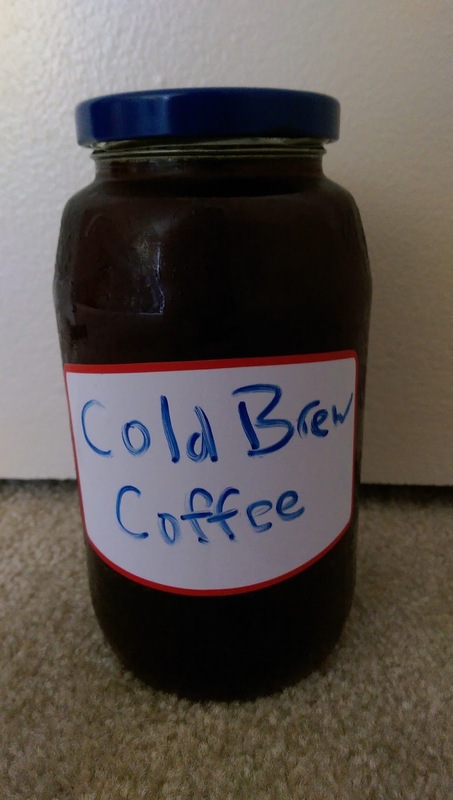 I found this to be a very helpful article for the how to: Cold Brew Coffee. This is more of a formula than a recipe strictly speaking. I like to make my cold brew in a quart sized Mason jar and then I store it in an old jam jar, that's just slightly smaller than that. So, the quantities I use are based on that. However, the formula for brewing I use is 1/4 cup of coffee grounds to 1 cup of water. So, if you're using a smaller or large container, just stick to that ratio. 1. Put 3/4 cup ground coffee (coarsely ground is best) and 3 cups of water in a large Mason jar. Stir a few times to make sure the water and coffee are incorporated. Leave in the refrigerator for 12-24 hours. I usually try to prep mine either the night before or in the morning when I use up my last batch of cold brew. 2. Strain the coffee into a clean, airtight jar for storage. I use a cone drip filter, but you can also use cheesecloth in a strainer or the like. Just make sure it's something that will filter out all the grounds. Store the concentrated coffee in the refrigerator for up to a week. Mixed up and ready to drink! 3. To make a cup of iced coffee, you need to dilute your cold brew. I do 1 part coffee, 1 part milk, and 1 part water. Depending on how big my cup is and how much of a wake-up call I need, I usually do 1/2 to 3/4 a cup for each "part." Currently, I've been adding in a splash of creamer to sweeten and flavor my coffee, but I've also had great results with sugar and cinnamon. If you like a cup of black coffee, then simply do 1 part coffee to 2 parts water. Or, if you like really creamy coffee, you could always to 1 part coffee to 2 parts milk or the cream equivalent of your choosing. It's much more of an art than a science based on how you like your coffee. You may also find that you want more or less coffee to milk/water based on how strong you take your coffee. And that's it! Super simple and ever so rewarding. If you're a fan of iced coffee, I highly recommend trying it at least once. Another pro-tip: Use reusable ice cubes in your coffee so they don't water it down. 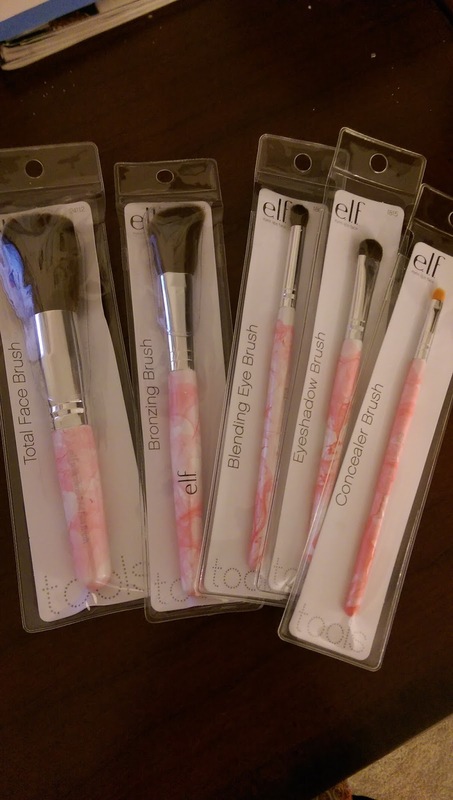 [I got mine at a discount store, but you can get them off Amazon. Here's a 30 pack of the kind I use for $10.99: Plastic Reusable Ice Cubes. I use them in all sorts of beverages that I don't want to get watered down- coffee, tea, smoothies, you name it!] If you don't have reusable ice cubes, then I recommend reducing the amount of water you put in initially to compensate for the melting ice cubes. I love just about everything made it oats- hot oatmeal, cold overnight oats, oatmeal cookies, granola, you name it. Granola is particularly nice to have around as a quick and easy breakfast, especially in the hotter months when hot oatmeal is unappealing, or as a snack. I like to eat it plain, with milk, or over yogurt. When I was in college, the dinning halls made a granola that was AMAZING. It had just the right amount and kind of extras, it was clumpy and crunchy, and was so delicious. 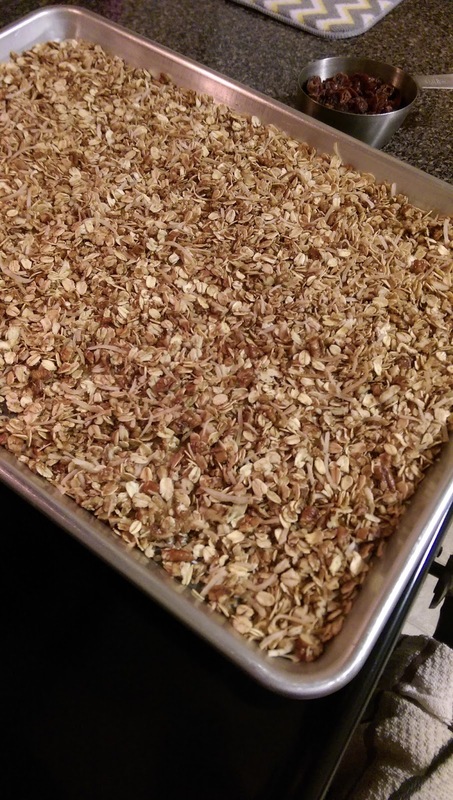 I always hate to buy granola, because it's so much more cost effective to make. 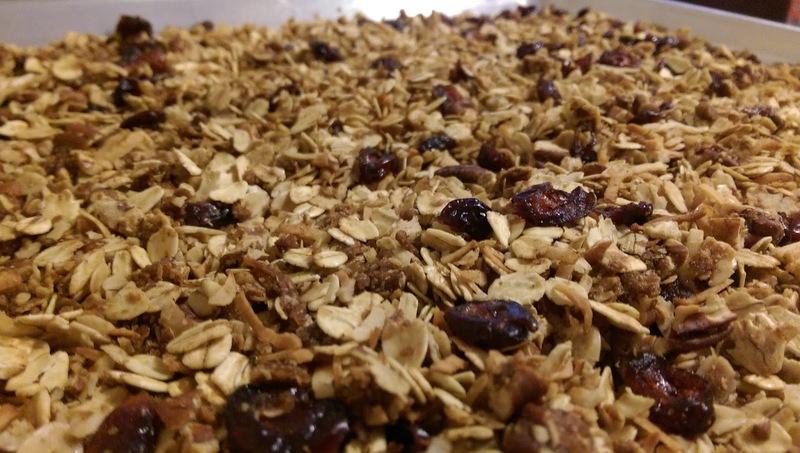 I'd made a few different kinds that were good, but not great, when I stumbled on this article: How to Make Granola Without a Recipe. This is a really wonderful blueprint to make any kind of granola you like. I highly recommend giving it a read and making up some recipes. I used this blueprint and some inspiration from a hot oatmeal flavor (Cranberry Pecan Vanilla) to wind up with my new favorite granola. 1. Preheat the oven to 350F and grease a large baking sheet with coconut oil. I like to put a silicone baking mat down first, as it makes transferring the granola into a container easier. 2. Mix together oats, pecans, coconut, brown sugar, cardamom, salt, cinnamon, and nutmeg. In a separate container, melt the coconut oil. Mix the extracts and honey into the oil. Pour the wet ingredients over the dry ingredients. Mix together thoroughly. 3. Spread the granola onto the baking sheet. Bake for 15-20 minutes, stirring halfway through the time. 4. Gently stir in the dried cranberries and bake for another 5 minutes. 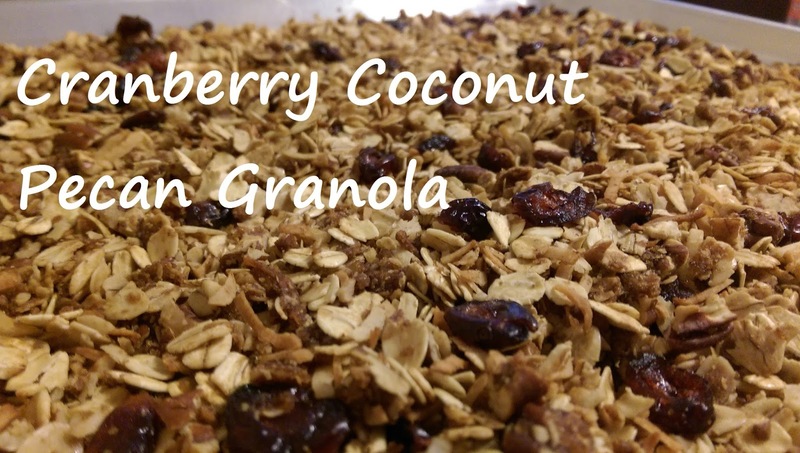 You want the oats, nuts, and coconut to be a golden brown and the cranberries to be softened and glistening. 4. Move baking sheet to a cooling rack. Let cool completely before putting into an airtight container. - Mix the granola up with your hands. Really, nothing does as good a job at getting the wet ingredients nice and incorporated into the dry. You want everything to be well coated with the honey and oil. - Don't stir the granola when it comes out of the oven the last time! You'll want to, because you've already done it a few times, but if you stir it before it cools, you'll break apart any clumps. Now, if you don't like clumps, then stir away. Personally, I like a few in there, especially if I plan on eating the granola on its own. If it's still not clumpy enough for you, up the amount of oil and/or honey. 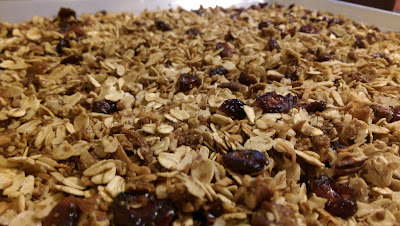 Yummy granola cooling after it's been baked. Super easy! I'm on my third batch of this recipe. Pretty much as soon as I run out, I make more- it's that good. I hope you enjoy it too! Pinterest can be misleading and I often find that what someone will say is a "simple" project, is anything but. However, I decided to give marbelizing a try for one of the Christmas presents I DIYed this year and it turned out to be pretty easy! I'd seen marbelizing a few different places, but the tutorial I followed was this one from A Bubbly Life. I found her instructions to be clear and her tips helpful. 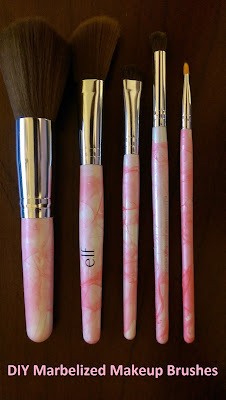 You may recall my post about my five must-have brushes. I picked up one of each from Walmart since they're inexpensive, have a white handle that I figured would make a good canvas for this project, and they're my favorite! The person I was going to give them to was my sister, which is why I decided to go with pink marbling. 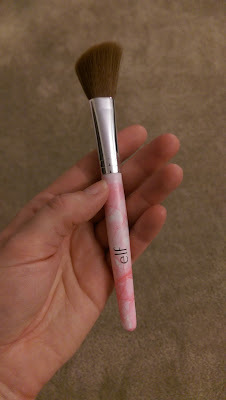 I could have easily used polish I already owned, but I decided to pick out a pink that was more "her" and then gave the polish to her as part of her gift. Her nails can match her brushes! I used a NYC polish, because they're a bargain at $1. Wet n wild also makes an inexpensive polish that would work great for this project. First, set up your work station. I have loads of extra packing paper from when we moved, so I used that to cover my work surface. This isn't a terribly messy project, but it gave me peace of mind knowing that I didn't have to worry about accidentally getting paint on the coffee table. Fill your container most of the way to the top with warm water. As you can see from the photo below, polish built up a bit on the inside of the jar as I worked. 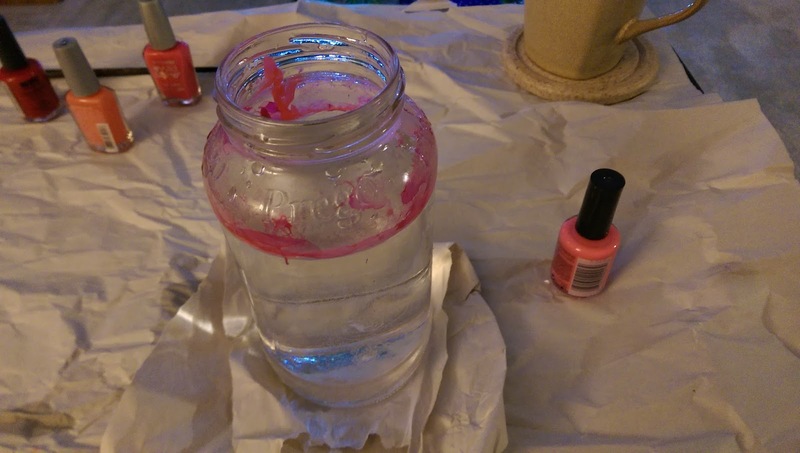 It did come off quite easily with nail polish remover, but I won't be using this jar for food any time soon. Keep that in mind when selecting your container. 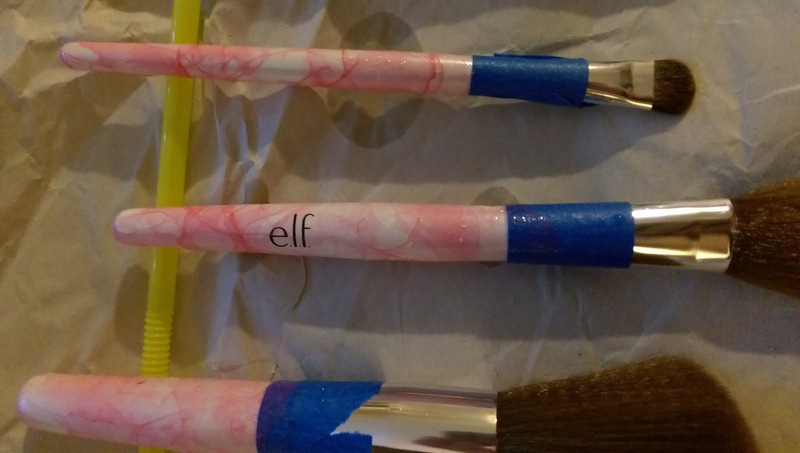 The other thing I did to prep was I put painter's tape around the farrow of my brushes (the metal part that holds the bristles) to ensure that I could get my marbling all the way to the edge but have it stop where I wanted it to. Jar of warm water ready to marbelize (this was after a few test runs, hence the polish up the sides). Bubbly Life recommends doing a few test runs with a straw (or some other disposable object similar in size and shape to whatever you're marbelizing). I highly recommend doing this. It took me a few tries to get the hang of what I was doing. While it's very easy, there is sort of an art to knowing when to dip your item in, how fast to dip it, and the right amount of swirl to give it. I also used the straws to try out colors. You can use just one color or multiple colors. I settled on just using the one color as I liked how it came out best. I also found it was hard to get more than one color into the jar and swirl before it started to dry too much. The actual marbelizing is quite simple. Put a few drops of polish into your jar. 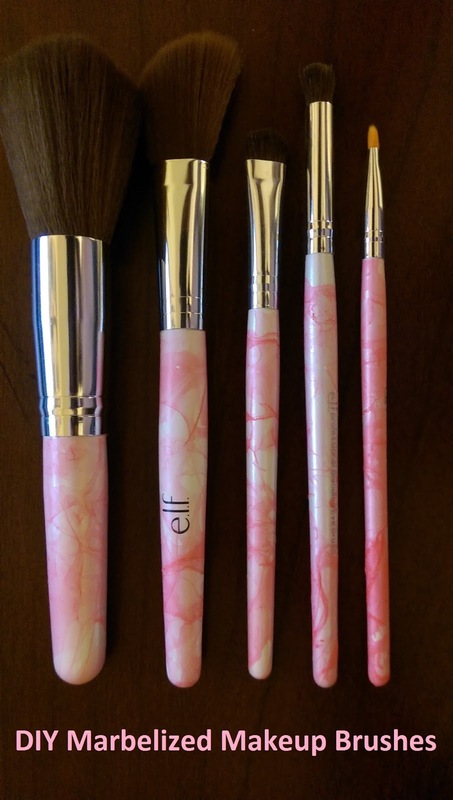 I generally used 3ish for my brushes. Again, that's something you can test with your straws. Bubbly Life tells you to "gently swirl the bowl." I found that to be unnecessary and result in the paint all over the jar (as you can see in the earlier photo). What I did was put the polish in and give it a couple seconds to spread. You don't want it to look like individual drops in the water, you want it to look more like a grease film spreading over the surface. Once the polish has spread, dip the brush in making a sort of swirling, corkscrew motion as you go down. If you dip straight down, it all sort of globs on the end of it. Sort of think of trying to hit the film of paint in different locations as you dunk it. Almost like when they put the cotton candy onto the paper cones. It's weird and sort of hard to describe, which is why testing it out with the straws is so helpful. You can dial in how much paint you like to use, how long you can wait before it dries to much, and how to get the motion down just right. The biggest thing to keep in mind that the polish will dry pretty quickly. If you wait too long after dropping it in the water, you'll end up with clumps instead of a nice thin film of paint. Brushes drying just after having dipped them. Once I'd dipped the brushes, I set them on a straw to start drying. The polish is only tacky at best once they're out of the water, so it won't stick to the straw, but I was afraid that setting them straight onto the paper might be a bad plan. Once I'd finished dipping them all and cleaned up everything, I used clothespins to hang them from a wire hanger, bristle sides up (so the opposite of how you'd dry them if you'd just washed them). I let them dry over night to make sure they were completely dry and then removed the painter's tape. Finished product! This was the one I thought came out the best. And that's it! Pretty simple and the results are gorgeous. I liked how some brushes came out better than others, but they all came out nice enough to be gifts. Marbelized and back in their original packaging. Before I wrapped them up, I put them back in their original plastic packaging. You'd almost think I bought them that way! This is certainly a Pinterest DIY that I'd highly recommend. It's simple, quick, not too messy, and the results are fabulous. I caught the knitting bug in a big way this fall and have been knitting like crazy. 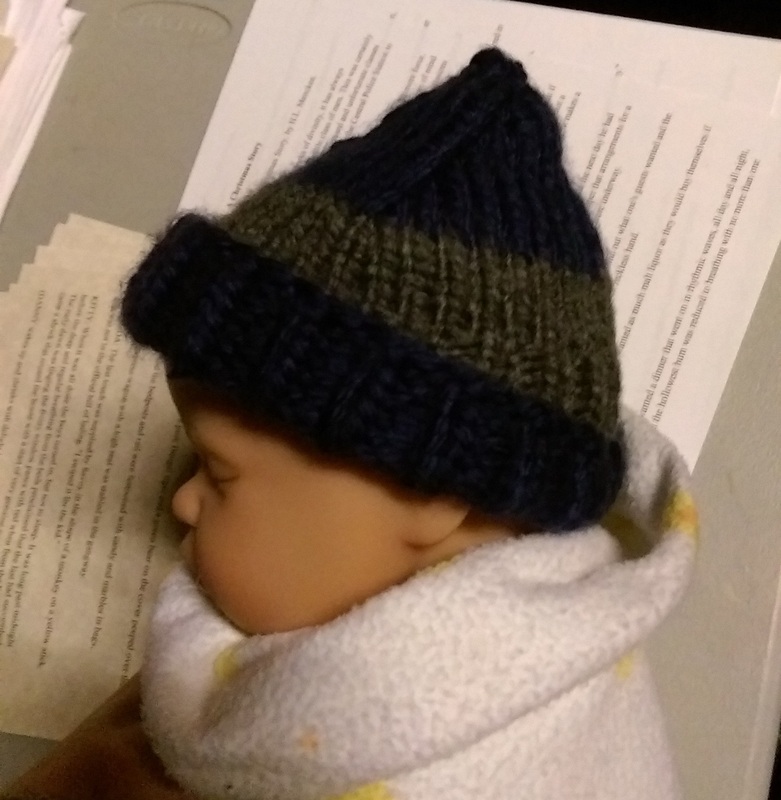 It all started when I realized that the shows I was working on were slow enough that I could knit while calling them (in other words, the cues were far enough apart, that I could actually pick up my knitting and do more than a handful of stitches before I'd have to put it down again). Because of the time of year, much of what I ended up knitting were presents, which is one of the reasons I haven't posted any of these yet. (And in fact I'm putting a delay on this post until I give my brother his present on Tuesday). My biggest accomplishment by far was finishing the pair of socks that I'd started last fall. While I did have to put quite a bit of time into them, the main reason it took that long was because I simply put them down for many months. To put it into perspective, while it took me almost exactly a year to knit the first sock, it only took me about a month and a half to do the second one (and there was a break in there to knit a birthday present). Anyways, here are my first pair of socks! 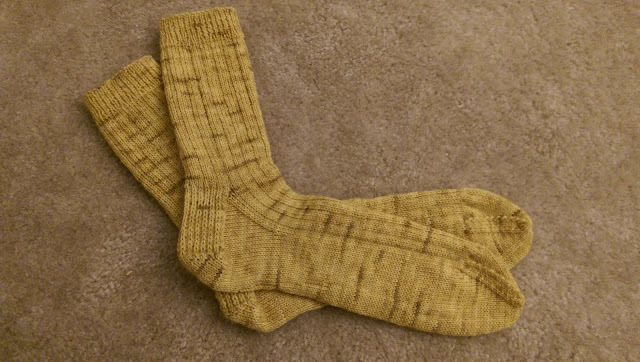 My first every pair of socks! Link to the Ravelry project here. They were very daunting before I started and while I was making the first one, but once I started the second one, it because much less terrifying. I'm actually looking forward to making more socks in the future. I mentioned pausing the socks to knit a present. The present in question was for my Mum's birthday. 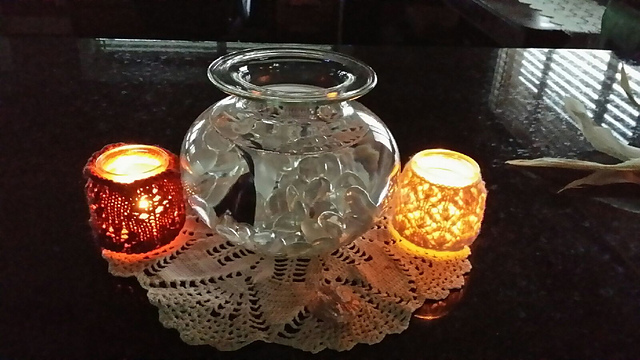 I made her covers for candle jars. Shown here with candles lit in them. Ravelry project here. The other big present I knit was for my brother, Thomas. He's recently moved to the east coast, so I've been using his birthday and Christmas as opportunities to ply him with warm weather gear. Last Christmas I knit him a hat. This year, I knit him a scarf, similar to the one's Mike and I have. They're all made out of three skeins of an alpaca/acrylic blend that's nice and toasty. 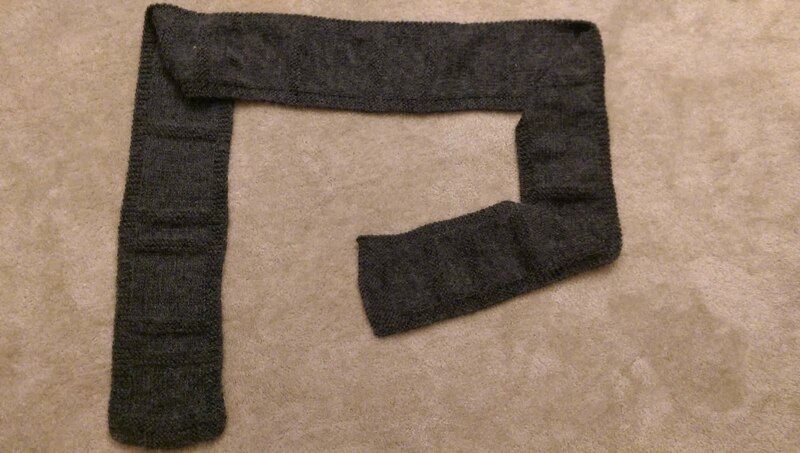 The pattern I used for his scarf involved knitting rectangles of varying lengths. The person who made the pattern had just done their lengths at random. I decided to have some fun and determined the length of the rectangles by pi. So the first is 3 inches, the next is 1 inch, then next is 4 inches, and so on. I ended up with pi all the way to the 16th decimal place. Not the best picture, but it gives you the idea. Ravelry project here. 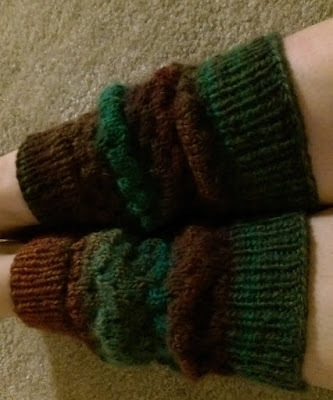 One of the only other non-gift items were these legwarmers. 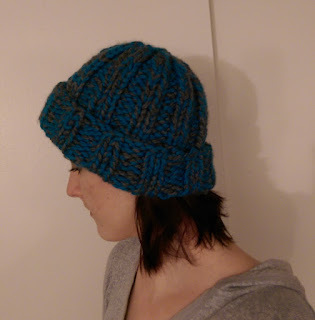 I had favorited a pattern a long time ago and decided to make it out of some yarn I'd gotten on clearance. These knit up really quick. I finished them in under a week. Quick and easy legwarmers! Ravelry project here. I wound up making four hats. 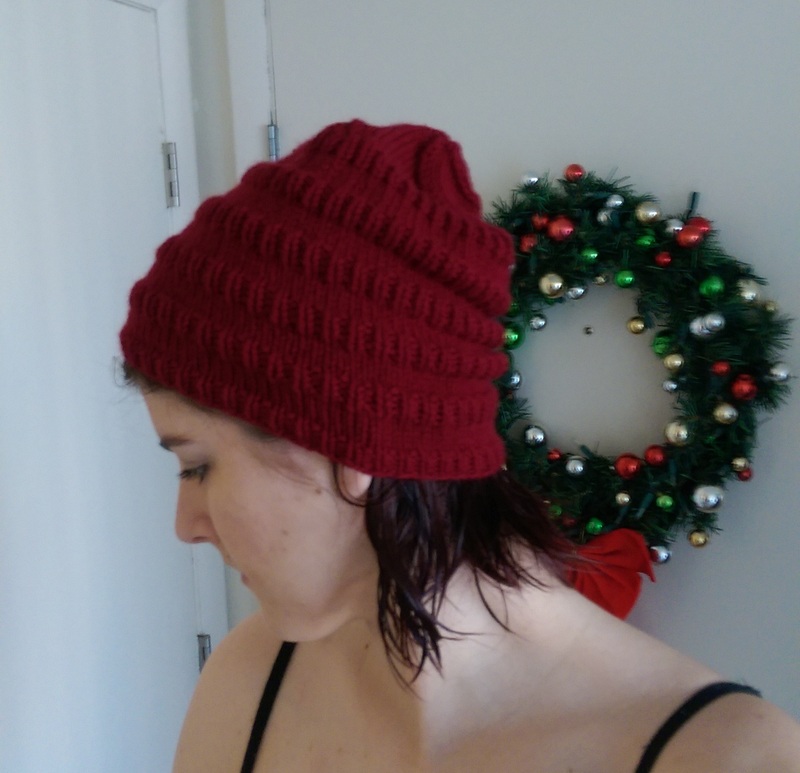 The first was a baby hat I knit in a couple hours for the Christmas show. Disaster struck while I was making that hat when I broke one of my interchangable needles. I should have known better than to knit bulky yarn with wooden needles, but it all worked out in the end because I got a replacement pair for Christmas. The second was a hat that I made for one of the girls in the box office. It was fun having her pick out a pattern and yarn. 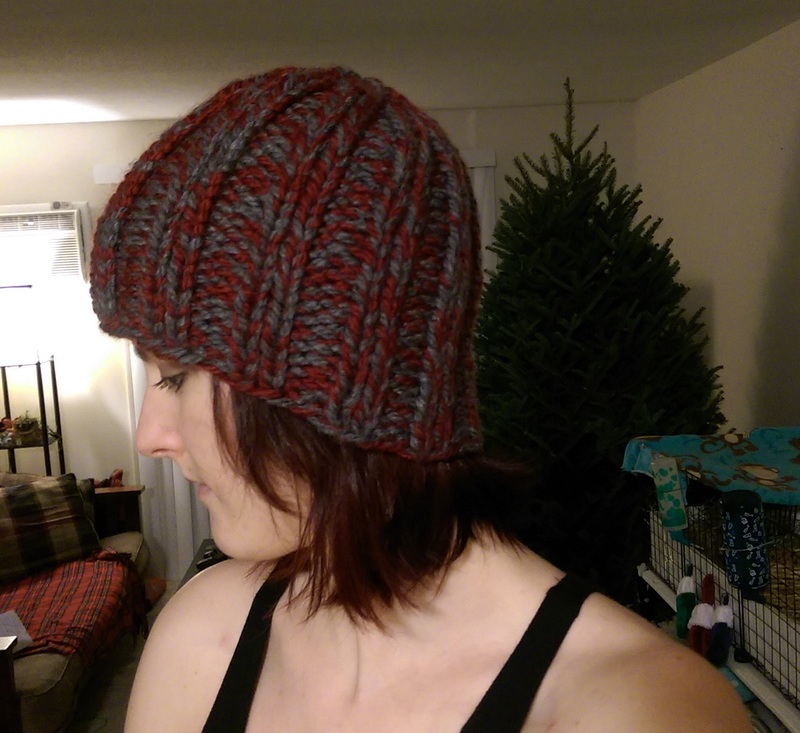 The pattern turned out to be super simple, which meant it knit up really quickly. Also a really quick knit were the other two hats I made, both from the same pattern with the same brand of yarn, just in different colors. The red one was for my Secret Santa and the blue one is for the Stoneham Theatre Yankee Swap. I made the blue one a little longer so that you could fold up the brim more comfortably. So many hats! Another thing I made multiples of were star ornaments. All the parents and grandparents got a framed photo of Mike and me (we actually got professional photos taken and everything) and a knit star ornament. I tried out three different star patterns. The first one was the one I ended up liking the best. 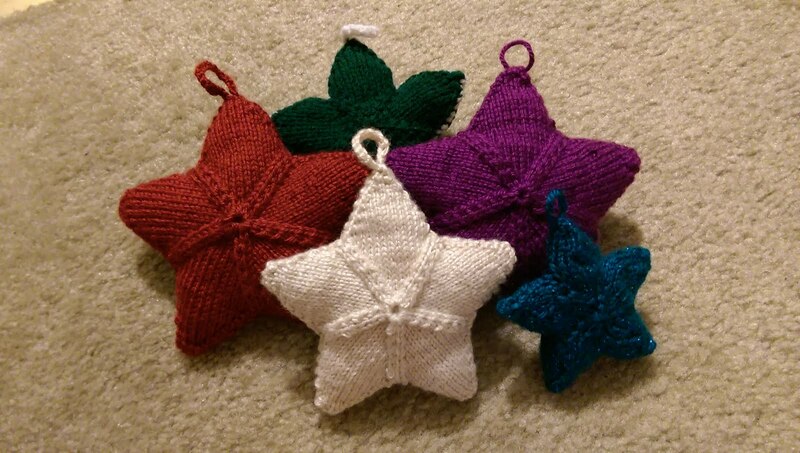 The cream, red, and purple star are all made using this pattern. I liked it the best because it was simple, it came out looking like a star, and it was pretty easy to make it look tidy. The second pattern was this one, which I made the green star out of. I didn't like this one as much because it looked too much like a flower or leaf to me. I also wound up liking this one the least because of the contrasting colored edging, which I felt like it needed so it wouldn't blend into the tree. The last pattern I tried was this one, which made the blue, sparkly star. This star wound up being the smallest and most difficult because of the kind of increases it called for. I also felt like the product just wasn't quite as tidy. All the star ornaments together! It was definitely a few months of quick knits. The stars were each only a day or two, the bulky hats all took me only a few hours of knitting each, and the next item took me only one performance to complete. 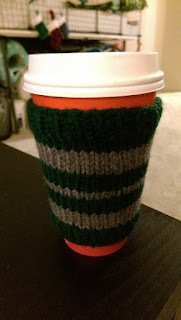 I knit a cup cozy for my Production Assistant Sarah. She's a big coffee drinker and she's a Slytherin, which is why I chose that particular color scheme. Slytherin cup cozy. Ravelry project here. The final thing I completed recently (the same day I composed this post in fact) I'm actually going to wait to post as it's also present-like in nature and won't be opened until later this month. I'm currently working on a pair of arm warmers for myself that I'm really excited about. It's a fun stitch pattern and I'm pretty happy with how they're coming out. Take a deep breath- the holidays are over! Knit 13 projects from start to finish, completed my socks, and got over halfway through my arm warmers. Sewed four Christmas presents- hand warmers for my Secret Santa (just like the one's I made last year), two guinea pig beds for the boys, and one cat bed for Slinky Cat. I also sewed the draft stopped I posted about. Baked three pumpkin pies (two with regular crust, one with gingersnap crust), apple pie crescent roll bites, chocolate chip scones, snicker doodles, bourbon balls, sugar cookies (made a double batch of over 100), homemade hot chocolate, and [drumroll please] a Yule Log complete with meringue mushrooms. I also made Thanksgiving dinner for Mike, Thomas, and myself, as well as all the day to day cooking. I did all my usual Christmas decorating and tree trimming. Tons of shopping and wrapping. Made one Pinterest inspired project as a present for my sister. Organized the Guinea Lynx Christmas card exchange. I did a photo shoot with the pigs and sent out almost 50 piggy adorned Christmas cards. And I'm sure lots more I'm not remembering at the moment. Like I said, I kept myself very busy. Quick DIY draft stopper (shown here in the hallway). We've been having a problem lately with the neighbor's cigarette smoke drifting into our kitchen. We're hoping that by making a draft stopper for that door, we might lessen the stale cigarette smell. I looked up a few online DIY's for draft stoppers. They're all very similar and super simple. Make a tube, fill it up, and sew it closed! I'm a bit of a fabric hoarder, considering how often I actually sew, so I knew I could find some scraps to make into a quick draft stopper. When I opened my tub of fabric, I stumbled on one of my husband's old shirts that I'd set aside to be used for something. It's from our days interning at MASS MoCA. He was going to toss it, as it had gotten too small and holey, but I grabbed it with the thought of somehow re-purposing it (at the very least as a rag). This seemed like the perfect use for it! I intended to cut the strips 8 1/2 inches tall by however long the door is (plus seam allowances). I was distracted when measuring, however, so I ended up with pieces 6 1/2 inches tall. It's a little thinner than I'd wanted, but I'm sure it will still work just fine. I sewed together my three sections so I had one long strip, then sewed up one end and made it into a tube. After turning it right side out, I filled mine with a mix of dry beans and rice. Once it was full, I hand stitched the open end closed. And that's it! Took me less than an hour from start to finish, and a lot of that was spent trying not to spill rice all over the floor while I filled it. Close up of the graphics from the T-shirt. It is important for this review to know that at my core, I am a tea person. And I really mean I am a TEA person. I regularly drink loose leaf tea (I have over 10 different varieties in the house at the moment) and both Mike and I have our special tea strainers. [Seriously, if you drink loose leaf tea, you MUST get one of these- IngenuiTEA.] We also have more kinds of bag tea than I can count, some leftover from before we converted and some because there are bag teas we haven't found a suitable loose leaf alternative for. Also, bag tea is much easier to tote around, something we both do. Every since I was little, I've always been a tea person. On rare occasions, I'd do coffee, but it's always been tea for me. The only exception to this rule used to be Starbucks' holiday beverages. My two favorites are the Gingerbread Latte and the Chestnut Praline Latte. The molasses on the top of the gingerbread makes it absolutely amazing and I love the sweet nuttiness of the chestnut praline. I usually splurge each holiday season and get each kind at least once. 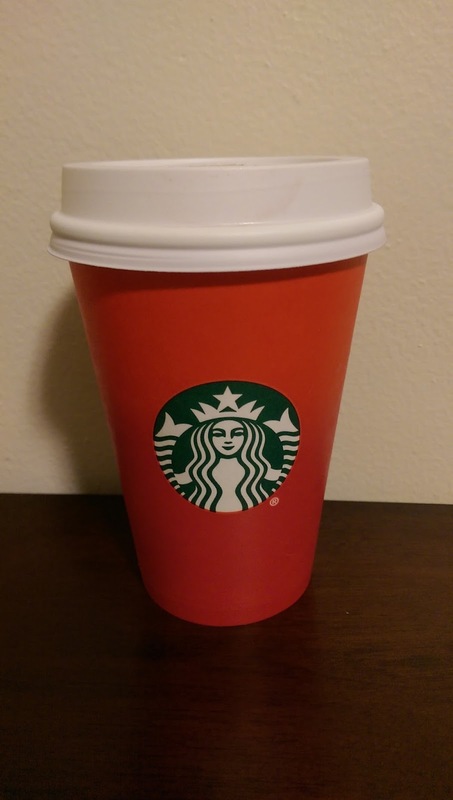 This year, I've already had a Gingerbread Latte. Usually, though, if I'm going to splurge on a drink at Starbucks, I'll get a Chai Latte (with soy milk! no dairy please!). It's one of my standard drink orders for any cafe, really. I LOVE chai. This past year, I discovered dirty chai lattes, which is when you get a shot of espresso in a chai latte. Ever since this discovery, I've usually allowed myself one of these during tech. They're a great, early morning punch of caffeine. It's all the goodness of chai with the strong presence of espresso. You know I'm tired if you every hear me order, "Hot, grande, Chai Latte with soy milk and a single shot of espresso." Even more recently than my discovery of the dirty chai, I've started drinking coffee much more frequently. The switch mainly occurred this summer when I was working at North Shore Music Theatre. The 9am call plus hot and ready coffee in the building made it entirely too easy to add a cup of coffee to my morning routine. Then, my first director back at Stoneham Theatre was very much a coffee person, so we bought good coffee for rehearsal and tech. Finally, my mum came to visit and I made her coffee every morning. All that together and I've been drinking significantly more coffee than I used to (more during tech than show runs, though). Because I've been drinking it more on the regular, I've discovered a few things. You can't always get lattes (they're expensive!) but I apparently really like hazelnut flavored coffee. Both HoneyDew and Dunkin Donuts have hazelnut coffee. My best find, though, was the 99 cent coffee at Cumberland Farms. There's one about 10 minutes away from Stoneham (same distance as the nearest Starbucks) and any size coffee, hot or iced, will be $1.06 after tax. You make it yourself and they have a ton of flavor and non-dairy creamer options. I usually double up on the hazelnut flavor and creamer. It makes for a delicious coffee! I've been trying not to drink coffee when I don't really need that extra caffeine, though, because I want to maintain a caffeine tolerance such that a coffee or an espresso still is more than my body is used to in the morning and I can turn to it when I need that extra jolt. All that in mind, today I tried the Gingerbread Tea Latte at Starbucks. I really wanted to like this, because it would be a delicious way to get my holiday fix without the caffeine punch of espresso. And since I'm inherently a tea person, it seemed like it would be a win-win. Unfortunately, it was quite disappointing. I've never been a huge fan of Teavana's black teas and whatever they picked, I believe it's their English Breakfast Tea, just didn't blend well with the Gingerbread flavors. It also seemed like they dialed back the gingerbread-y-ness of the latte. I'm used to much more spices and especially much more molasses in the regular Gingerbread Latte. That's the main reason I love it! This beverage failed for me on both the gingerbread and tea fronts, which meant it really had no redeeming qualities. In addition to the disappointing taste, it also took a long time for my order (despite the barista being fairly speedy) because the first time he made it for me, he made it with regular milk. Luckily, I saw him do it and asked him if it was soy when he tried to give it to me. He quickly made another, but it meant it just took that much longer. And, to top it off, I'm pretty sure that as a Starbucks Gold Card member, I was supposed to get another holiday beverage free because I bought one holiday beverage today at 3:30p. All in all, a sad, sad day in Starbucks land. You know those people who write blogs that are really streamlined and focused? I am not one of those people. I am not paid or compensated in any way for the products I use and review.